5G is and will be transformational – not only in terms of the network but also in terms of what the technology enables and the resulting business opportunities. As Sameh Yamany, our CTO describes in his Forbes article When 5G Hype Becomes Reality, 5G is not simply “4G on steroids”. It’s not just about more bandwidth although that is certainly a key consideration. It’s about so many more “things” being connected. Some applications will require super fast connections, like HD video; some will require very low latency, for example connected cars and some will require low latency and high reliability, for example connected car and some will require low bandwidth such as smart meters. The aspirational capabilities of 5G are ultimately driven by a desire to create a network able to simultaneously satisfy a vast range of use cases with widely disparate performance characteristics. The adaptable and dynamic network that results will foster an ecosystem in which new services that were previously not possible can be created. The resulting technological inflection may even see the emergence of whole new industries. Let’s look at the network transformation. The earliest 5G deployments are based on non-stand-alone configurations, where existing 4G infrastructure are used supporting the 5G new radio (5G NR). In this initial phase of 5G deployment, the focus is on enhanced mobile broadband (eMBB) to provide increased data bandwidth and connection reliability. Unlike LTE, 5G NR will support higher-frequency operation from day one. 5G NR will introduce flexible spectrum usage with scalable numerology, dynamic TDD, massive MIMO and beam forming, all of which will introduce greater challenges in the field for RF engineers validating, testing and optimizing the 5G network. So, why do we say the 5G RAN is the New Core? If we look back to traditional 3G/4G networks there is a clear delineation between the RAN and core. The eNodeB in 4G for example in the RAN will connect with a serving gateway in a centralized core. 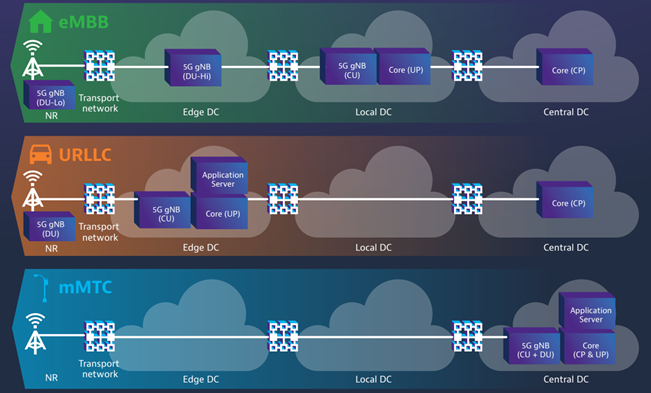 With 5G however there is a need for a more flexible, liquid, virtual and open RAN architecture… and one that is more intelligent. New interfaces are created which offer access points to data intelligence as we move to a dis-aggregated 5G RAN architecture. Protocol layers are split across the various network elements to satisfy cost, flexibility and service-specific needs. With Mobile Edge Computing (MEC) you may now find that the application server is much closer to the edge (to satisfy for example low latency applications) and so user plane information that you typically would have accessed at the core will now be accessed only in the RAN is some instances. This intimate visibility into the network dynamics is unprecedented and will facilitate a wide range of applications including detecting anomalies in the network, troubleshooting service-affecting issues, optimizing the performance, leveraging revenue-aware analytics and even monetizing the network. This degree of visibility is also essential for the machine intelligence that is needed to fully harness the power of the next generation 5G network to balance the needs of the numerous and dynamic services that must be supported simultaneously. Of course, harnessing data intelligence from such a complex RAN and delivering insight which can be used by a wide range of applications whether you are just trying to troubleshoot service affecting issues or whether you are trying to leverage revenue-aware analytics issues is a non-trivial task. The network gold will be there in 5G – you might just need some help mining it!